House, 2 Bedrooms, 2 bath, family room, rec lounge, and fenced yard. Park the car, drop your bags, and head to the nearby beach. That's how we start vacations 'Up North'! Newlyweds to 'empty nesters' can relax with an affordable vacation in the quaint Village of Elk Rapids. Just 15 minutes north of Traverse City, the Village of Elk Rapids is nestled between the eastern arm of Grand Traverse Bay, the cool blue waters of Elk Lake, and the other 'finger lakes' of Antrim County. We are dead center in a Lake Michigan “arc of hospitality” that stretches from the artist community of Northport to the historic sites of Mackinac Island. Our newly expanded 1400 sq. ft. two bedroom home is fully furnished with a dining room, spacious and comfortable family room (with fold out sofa), fenced back yard, and bonus game room. A sliding door leads onto the enclosed slate patio to sip your morning coffee. The 16x16 master bedroom has the feel of a sumptuous suite with walk-in closet, on- suite master bath and seating area. The second bedroom has two twin beds. The kitchen leads into the dining room and also opens onto the patio. Just off the back yard is the newly added 'Cedar Street Lounge'; a play room with large screen TV, iPod player, Nintendo Wii, and gaming table. It is the perfect spot for rainy days, after a long day at the beach, or for evening relaxation in front of the fire pit. A short walk or bike ride takes you to Elk Rapids' Main Street and easy access to the beach, tennis or basketball at the local park, shopping, dining, boating, movies, or enjoy an ice cream on the river bank in one of northern Michigan's best kept secret vacation getaways. Enjoy four seasons living in our quaint Village. Whether you visit local attractions like Elk Lake, Bass Lake or Torch Lake or drive 15 minutes to Traverse Bay, everything is close. Or you can visit the attractions that make Traverse City one of the 'Ten Best Small Towns in America' (Fodor) and got it on National Geographic's 'Top 10 Summer Trips' then leave the crowds behind for your “sanctuary” in Elk Rapids. Elk Rapids gives you access to the best of Grand Traverse area attractions with the peace and quiet of real small town life a. You'll like Traverse City but you'll love Elk Rapids! After 30 yrs of coming back home (see i grew up in Traverse City) we finally found the perfect place to purchase. Cozy and comfortable, this home and this town was what TC was when I moved there in 1972. Veterans Park named one of the best beaches in Norther Michigan. Elk Lake part of the "finger lakes" including Skegemog and Torch Lake. Ample parking for 3 cars out front with room for boat back off the alley. Half garage. Front turned into an entertainment place with video games, large TV, etc. Fully functional computer with printer all set and ready to go! Wireless internet open to public without password. Leather furniture lets all rest comfortably. Well stocked kitchen with new refrigerator and gas range. Microwave also included. Leaves on table pull out for up to six or stay in for a cozy twosome. Two places to watch movies - family room and 'lounge' off the patio. Easy beach reads and action thrillers all for your enjoyment. Books in 2nd bedroom and in the 'lounge' out back. Nintendo Wii with sports and resort games available. Board games and family games in the 'lounge' along with a game table. There are some videos left behind. Wii games available but you can bring yours along as well. Bikes are in the garage part of the lounge. Slate patio with dining table and large umbrella. We also have a fire pit for evening gatherings. Tennis courts available down at Veterans Park only 5 blocks away. Elk Rapids Golf Club a very short drive away. 9 hole course with very low rates. Easy to "walk on" for tee times. The home is very cozy. We're able to walk to town and all the fun. Great house with everything you could need! We stayed in this lovely home for a week in N Michigan and thoroughly enjoyed the home, Elk Rapids and all that the surrounding area has to offer. 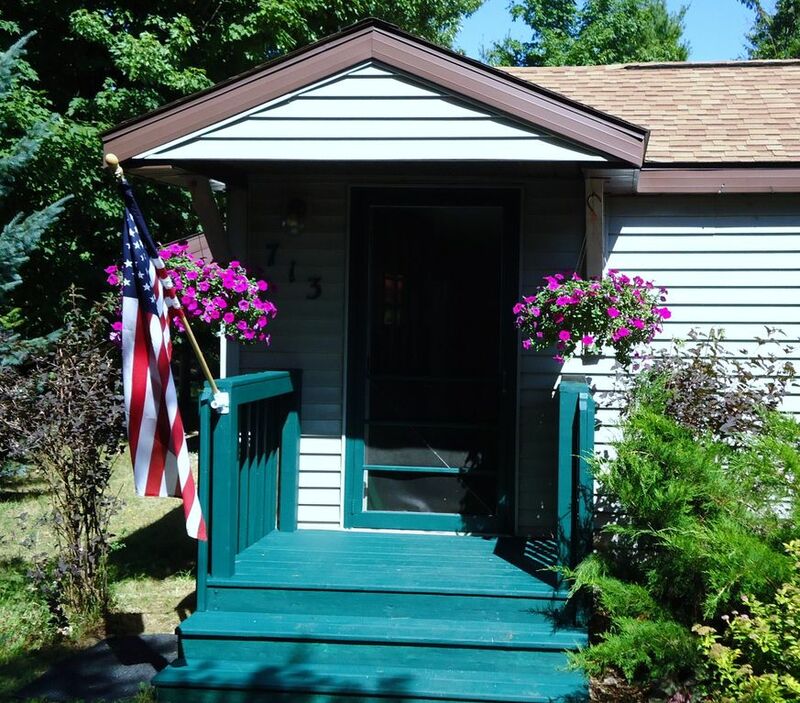 The home is a quick bike/walk to the beach and the shops/dining of downtown Elk Rapids. Ben is very responsive and even helped me track down an item that was left behind. Will return again, for sure. This house and location was amazing! The house has way more space then you think and is very clean. Elk Rapids and Ben's home were amazing! The location and town are a perfect getaway for families. The beach and water are absolutely beautiful with a little park for your kids to play at. Ben's home was way more then we could have ever asked for! The house itself was huge, clean, and comfortable:) If we ever come back we for sure will rent this place again! Thanks Ben! Thank you for your kind words. We work hard to make it feel like home for everyone that comes to us. Hope to see you in the future. All the comforts of home . . .
Well appointed with everything you need to have a relaxing vacation. Fenced yard great for my dog. Thank you. We try to make is as much like 'home' as possible. Glad the dog was happy too. We had a great time in Elk Rapids and at this house. It was a perfect size for two people. We used the spare bedroom for storage of luggage etc. Master bedroom was huge w/living area and big TV. Window A.C. in master only, but that was plenty. Our dogs loved fenced backyard and patio w/trees and deck was so nice that we had breakfast out there everyday. The two bicycles enabled us to bike to downtown whenever we wanted. Elk Rapids is a lovely little town. The landlord was super nice. The only down side is Traverse City is a 20 minute drive and if you need anything beyond the basics you have to go there. Otherwise great. Spent two weeks in the house last summer. Wonderful time. Very comfortable. Elk Rapids is a great place to unwind. Easy stroll to downtown for shopping, dining, taking in a movie, or just hitting the ice cream store. The Village of Elk Rapids is an easy place to relax and unwind with an unhurried lifestyle. New master bedroom and bath being added late 2013. For rental times not shown above, please call or send email.